It’s one of those days when everything technical seems to be at odds with me. This is a common theme but one I’ve learned to just laugh about. The smart phones and smart cars sometimes are just smarter than me. So between the tech hurdles and the fact that it is raining here in New England where it should be snowing, I’ve decided to get out my favorite grains and start cooking. I love millet and it is my favorite grain for breakfast. I made this very simple millet and corn recipe this morning and even though all things technological have failed me, my millet and corn did not. When cooking millet remember a little goes a long way. 1 cup uncooked millet will yield you about 3 cups of cooked grain. Though corn is difficult to find in a non GMO variety It is out there. The link below is one potential place to find it but also ask your grocery store or whole foods market to find it for you. Place millet in a heavy pot, add water and salt. Place a flame deflector under the pot, reduce flame to medium-low and simmer for approximately 20 minutes. Add corn to pot and simmer for an additional 10 minutes until most water has cooked out. Check the pot to make sure the millet is not sticking to the bottom or burning. Adjust flame as needed. Millet supports kidney, liver. stomach and spleen function. It is used for gastrointestinal irregularities and cooking it with winter squash increases its medicinal value. Millet is very helpful in regulating blood sugar and has been effective when used to treat thrush. 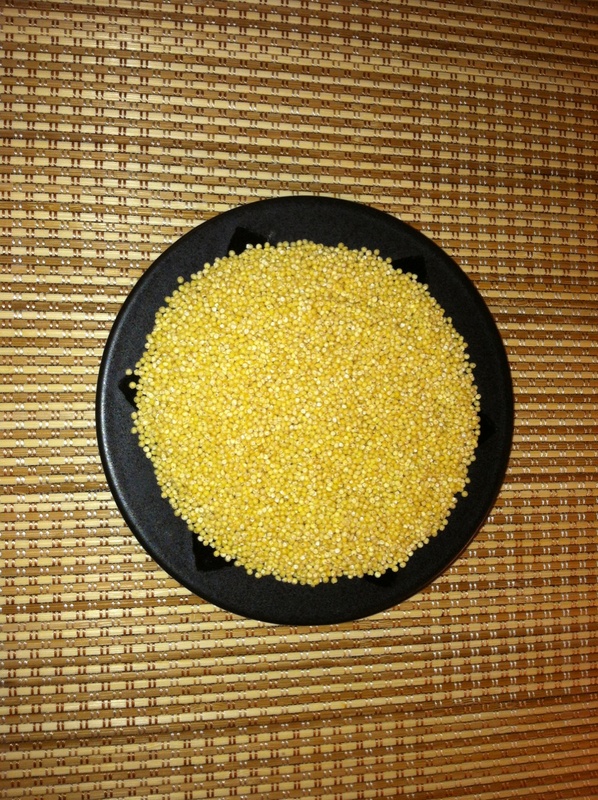 Millet is also helpful in reducing inflammation and pain related to rheumatic and arthritic conditions. Millet contains all the necessary amino acids we need, it is high in protein, iron, phosphorus and B vitamins especially niacin. It is also gluten free and due to its high alkaline ash content it is the easiest grain to digest. 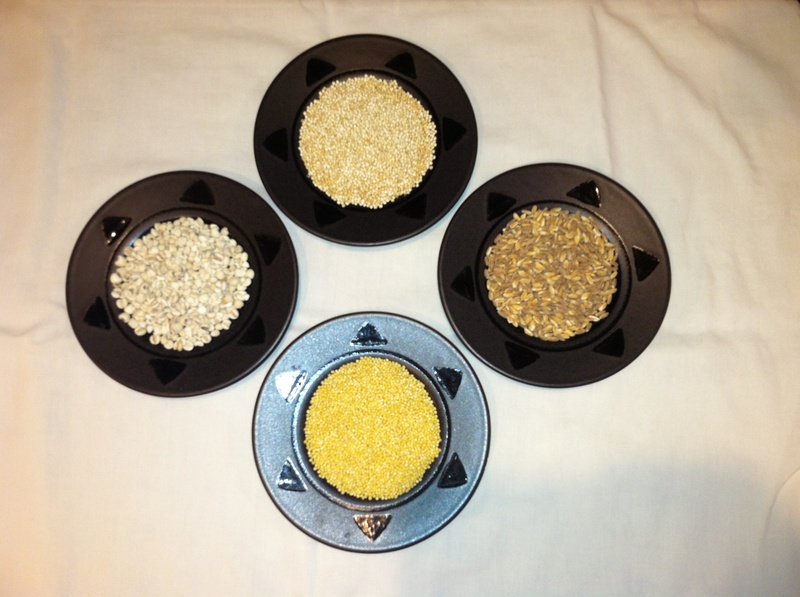 Picture above are at the far left Hato Mugi or Job’s Tears; top grain is Quinoa; right grain is Farro; bottom grain is Millet. Another favorite grain for me is quinoa. Although it is technically a seed, quinoa is a fantastic side dish and can be used as a grain. Last night I made a very simple quinoa as a side for my maple glazed salmon. As with all grains I recommend rinsing well and in most cases soaking grains overnight. Quinoa does not have to be soaked overnight, but be sure to rinse it well and soak for about 20 minutes then re-rinse to assure all the bitter saponins are rinsed away. I simply used 1/2 cup of tri-color (red, white and brown) quinoa to 1 cup organic non GMO vegetable broth. Place the quinoa in broth, bring to a boil, cook for no more than 5 minutes and then let it rest for about 10 minutes before serving. Allowing it to rest in a lidded pan brings out it’s nutty flavor and also makes it fluffy rather than sticky. Other delightful and healing grains include Hato Mugi, from Asian which is also a seed, and Farro an ancient grain originating in Italy. Hato Mugi is said to aid in reducing bloating, lowers blood sugar levels, enhances beautiful skin and has been used as a cancer fighting food. If you are pregnant or breast feeding it is not advised to eat Hato Mugi. Farro is high in fiber and mineral rich. It can be used in the same way as rice and is often used by Italian cooks in their risotto dishes.